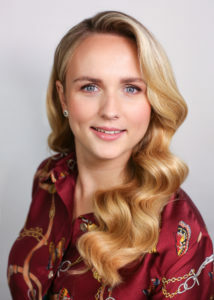 Hollywood waves are Academy tutor Kasia’s speciality and a huge draw for discerning brides who specifically book her as there’s not many hairstylists out there that can achieve them to such a flawless red-carpet-worthy standard. It’s a style that you simply have to have in your repertoire and there’s no better tutor to learn from. They look as astounding in photographs as they do in real life and clients who choose this style don’t just end up looking like a movie star but feeling like one too. They’ll become your biggest fans and promoters of your work. Every time this style is posted on Insta we get enquiries streaming in through PMs and e-mails as brides-to-be WANT to look just as magnificent and jaw-droppingly gorgeous. How to brush out the curls and which setting sprays to use for that long-lasting glossy finish. Model is Augusta who’s a real bride-to-be as well as a wonderful wedding florist.